In his writing, “I loved the feeling of being in control when my life was not,” Dr. Palmer told the Globe. A physician who nearly lost his career to drug and alcohol dependency, Dr. Michael Palmer found his way back to his calling partly by helping heal other doctors, and by replacing his daily pills with a page of writing every night. Starting with “The Sisterhood” in 1982, Dr. Palmer launched a parallel career as a best-selling author. Although he could have set aside medicine for the medical thrillers that made him famous around the world, he continued to treat patients for years in Falmouth Hospital’s emergency room and to work with troubled doctors as associate director of the Massachusetts Medical Society’s Physician Health Services. Dr. Palmer, whose reputation for giving his time freely to aspiring writers was as legendary as his devotion to his three sons, died of complications from a heart attack and stroke Wednesday in New York City while he was on his way home from a safari in Africa. He was 71 and lived in Swampscott. For readers, Dr. Palmer offered books that opened a window into the medical profession. If Robert B. Parker used his hard-boiled detective, Spenser, to introduce the world to the streets of Boston, Dr. Palmer took those readers inside the city’s hospitals. Translated into 35 languages, his first 19 books sold an estimated 5 million copies. His 20th book is scheduled to be published May 20. Dr. Palmer’s fourth book, 1991’s “Extreme Measures,” was made into a 1996 movie starring Hugh Grant, Gene Hackman, and Sarah Jessica Parker. Self-deprecating in the face of success, Dr. Palmer made a point of knowing and thanking all who helped place his books in the hands of readers. Dr. Palmer’s editor said his visits to the publishing house’s New York offices always stretched long beyond the 10 or 15 minutes many authors stay before heading out for a swanky lunch. “He wanted to talk and connect with everyone who worked on his book, from the cover designer to the production editors to the publicity department to the marketing department,” said Jennifer Enderlin, senior vice president and publisher of St. Martin’s Press and Dr. Palmer’s editor the past 10 years. He also liked sharing his joy with others, including those who approached him at book signings and writers’ gatherings in hopes of learning how to follow him onto bestseller lists. 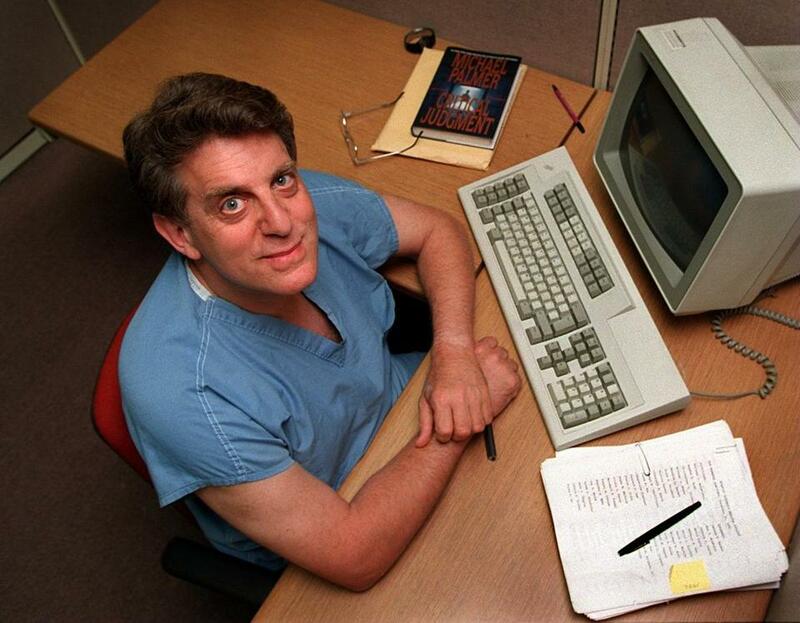 Dr. Palmer gave almost as much of his time to the International Thriller Writers association as he did to the Massachusetts Medical Society’s Physician Health Services. Born in Springfield, Dr. Palmer grew up in Longmeadow, one of three children whose father was an optometrist. He graduated at Case Western Reserve University School of Medicine and trained at Boston City Hospital and Massachusetts General Hospital. His marriages to Judith Grass and Noelle Shaughnessy ended in divorce. For a while, it seemed as if his career, if not his life, might end, too. He was charged with writing false prescriptions. “A group of doctors with problems similar to mine mentored me and helped me,” he told the Globe in 2008. Writing eventually offered a way to shape his characters’ lives and, eventually, his own. Along with offering assistance to other writers, Dr. Palmer drew his sons toward the field. Daniel is a published author and Matthew, of Belgrade, has a book due out in June. In addition to his sons Matthew and Daniel, Dr. Palmer leaves his companion, Robin Broady of Swampscott; another son, Luke, of Brooklyn; two sisters, Donna Prince of Newton and Susan Palmer Terry of Concord, N.H.; and four grandchildren. Services will be private.